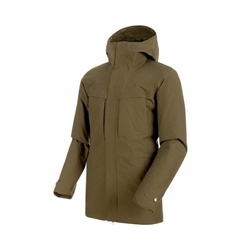 Mammut Chamuera HS Thermo Hooded Parka. Don't let bad weather bother you in everyday life: the Chamuera HS Thermo Hooded Parka Men withstands the wind and rain thanks to the 2-layer Mammut DRYtechnology material. While the cotton-look outer material boasts an urban look and feel, the side and chest pockets make the jacket an everyday must-have that holds all of your day-to-day essentials. The synthetic Ajungilak filling keeps you warm in the wind and weather.